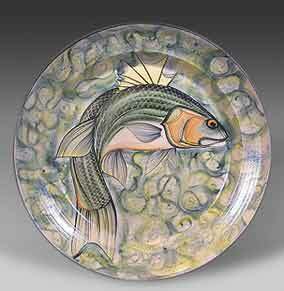 Adrian Brough bass platter - 20" (508 mm) diameter. 2001. 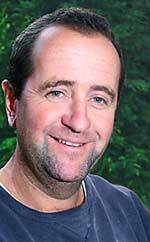 Adrian James Brough was born in Brixham, Devon, in 1962 - the son of Alan Brough. He moved to Cornwall at the age of seven when his father started at the Leach Pottery and was educated at St Ives and nearby Lelant where he now lives. His introduction to pottery was, understandably, through his father. As a youngster he earned his pocket money by glazing and kiln-stacking at Alan's newly opened pottery at Newlyn. At the age of eighteen he started a four-year course at Cornwall Technical College at Camborne where he was taught to throw by his Lelant neighbour Bill Marshall. In 1984 he left Camborne with a design diploma (distinction) and membership of the Society of Designer Craftsmen and the Society for Industrial Artists and Designers. He went to work at his father's pottery in Newlyn where he received his first major commission for SWEB - the South-West Electricity Board. Other similar commissions followed. By 1990 he was ready to build his own studio at home in Lelant where he started production of a range of decorative high-fired earthenware. His influences are Chinese, Korean and Portuguese, and his designs are strongly flavoured by his environment - in the toe of Cornwall there is sea to the North, West and South, and fish feature strongly in Adrian's work. His work is sold through local galleries, and is widely exhibited both at home and abroad.